The historical use of honey bee pollen may be traced back to ancient times; the Bible and the Koran refer to it as a promoter of health and long-lasting youth, while Hippocrates, the Greek Physician and father of medicine, extolled its many healing virtues. Pollen grains are collected by female worker bees from a wide variety of plants. The pollen from flowers stick to the bee’s hind legs and gets mixed with nectar and saliva to form a pellet which is carried back to the hive as the bees’ main food supply. A single pellet contains 2,000,000 flower pollen grains, whilst a single teaspoon contains 2.5 billion grains of flower pollen. 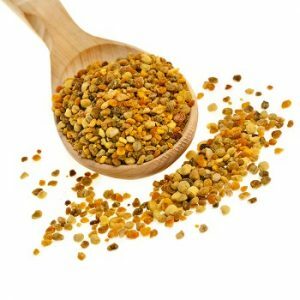 Bee pollen is considered one of nature’s most completely nourishing foods, with nearly all the nutrients required by humans. It is, for example, protein rich (approx 25%) in the form of 18 free amino acids, ready for use by the body – more protein than meat, eggs and cheese. It’s also a source of vitamin B12, which is good news for vegetarians. Studies show that pollen may have some benefits in men suffering from chronic prostatitis or enlarged prostate. Other evidence suggests that a product containing bee pollen (and other related ingredients) helped reduce PMS symptoms. The same product has been found to reduce symptoms associated with menopause such as hot flashes. Small studies from China suggest that bee pollen might reduce some side effects of radiation therapy for cancer. Anecdotal evidence suggests that bee pollen may also be a key to a long health life. Years ago, Professor Nicolai Tsitsin, a biologist and experimental botanist from the Longevity Institute of the former USSR, showed bee pollen was one of the reasons for the abundance of centenarians in the Caucasus Mountains of Soviet Georgia. All of the 200 people over the age of 125 whom he studied were regular consumers of the bee pollen in raw honey. Bee pollen is also great for vegetarians who feel in need of animal nutrition but prefer not to eat meat. The recommended dose of bee pollen is just 6g (one teaspoon) daily so it’s easy to incorporate into your daily routine. Try sprinkling it on cereal or muesli or as a topping (try it with honey!) on yoghurt, ice cream, porridge or even toast, or mixed into smoothies and juices. Or you can just take it straight from the spoon. There is only one caution: bee pollen supplements should be avoided by those allergic to bee stings, honey and bee products as they can provoke allergic reactions. If you are unsure, always test for allergy by ingesting one pellet first. Always choose organic bee pollen, which is the result of careful and natural bee-keeping that is considerate of the bees, the environment and the final product. A net or thin mesh is placed on the main entrance of the beehives, when the bee enters the largest pollen pellets fall off and are gathered in a collection box. This takes place 3-4 days of the week, for no longer than 4-5 weeks, ensuring the bees have a sufficient pollen for their own nourishment. Choosing organic is important for your health and well being, and that of the environment. A 2010 study from the US found 121 different types of pesticides within 887 wax, pollen, bee and hive samples – not something you want to be ingesting as a supplement. Are there GMOs in your honey?